We all know that the Prime Minister loves an oversized necklace, and perhaps her ultimate favourite is the Ballsmania collection from Mirta Bijoux. When she came to office, the PM had one navy Ballsmania necklace. 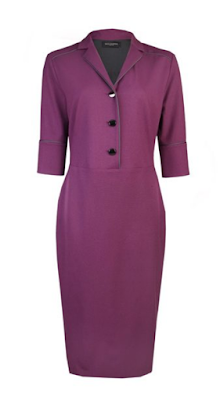 She wore it frequently with a sky blue coat from Hobbs and a navy shift dress - the perfect pairing! Since then, her collection has grown - and we've counted another 7 additions to the mix. From classic black to a standout metallic blue, the Ballsmania necklaces (and bracelets!) 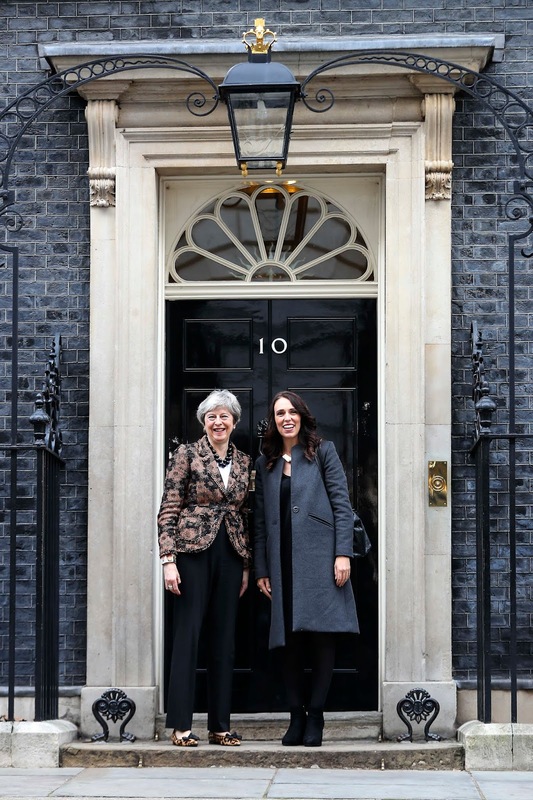 are providing a welcome pop of colour and sass to May's outfits. 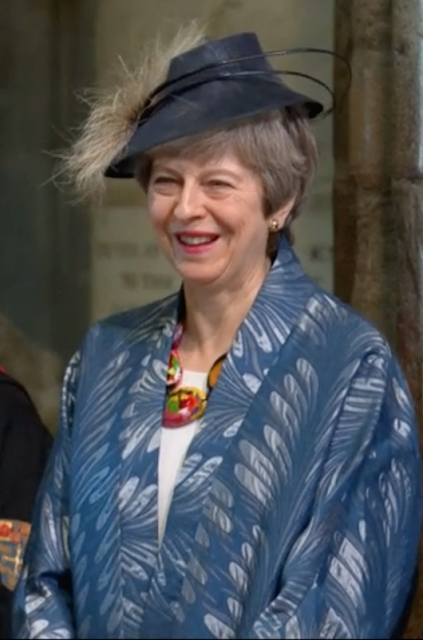 And at a time where every discussion seems to be on Brexit, it's a welcome distraction to chat about some serious accessorising from the Prime Minister. So what's cool about these particular necklaces? The versatility of these pieces are what first struck me. We've seen the PM wear hers in the Commons Chamber and when out and about in her Maidenhead constituency - as well as when visiting countries as part of her official duties. They look great with a formal dress and also paired with a casual tee shirt and jeans. 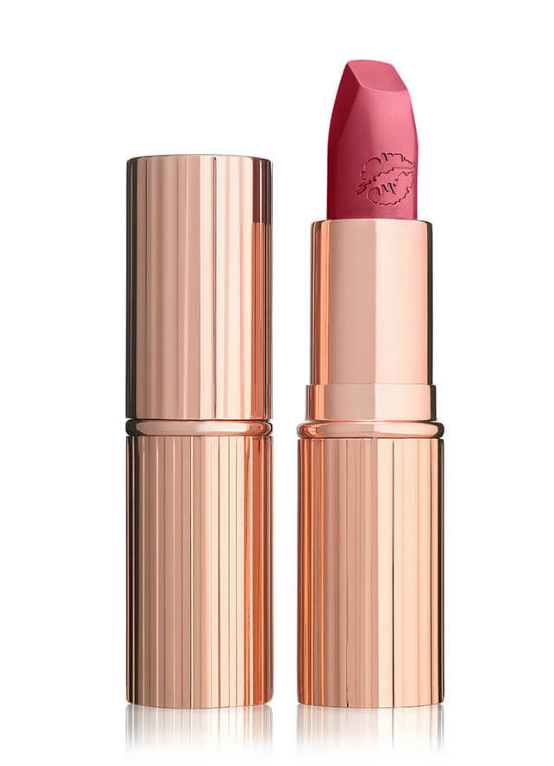 There are 100 colour combinations in the collection to try, and each item is handmade to the highest standards using non toxic colours and no nickel. 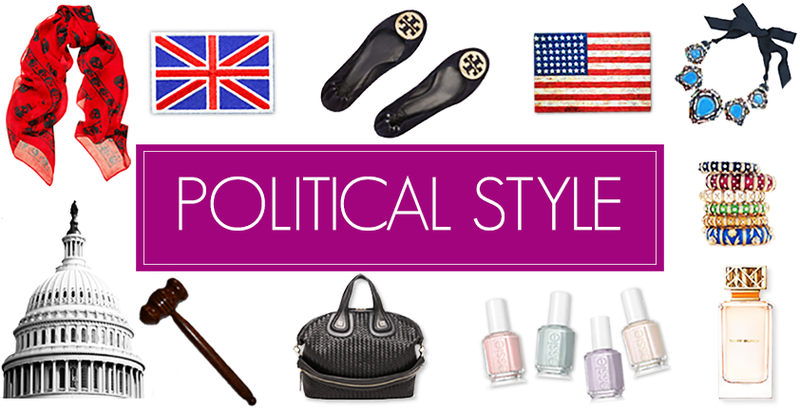 Politics doesn't have to be all about policy, and with voters wanting to understand the personal behind the public face, fashion is a great way to tell that story. May has embraced this, and despite being a private person, uses her great sense of style to show that she likes to have fun with what she wears. Her quirky taste in jewellery is just one way she does this, and her Mirta pieces are some of our personal favourites. 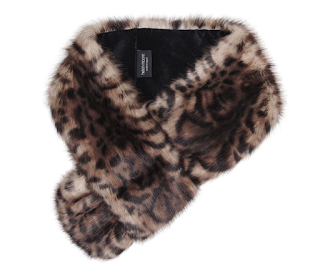 Whether it's a fantastic coat, sassy shoes or some really cool jewellery- May knows how to make an impression! Which are your favourite Mirta Bijoux Ballsmania items? Let me know in the comments. And a big thank you to Mirta Bijoux for sending me two of the Ballsmania items to try and style! There's nothing quite like a good night's sleep, and with life going at 200 miles an hour, I'm a girl who needs her nap time. I don't get as much sleep as I would like, and am always looking for tips, tricks- and comfy bedding that will help me get the rest I need. I recently discovered Bedsure, a premium bedding and home solutions brand that creates products with smart technology that help its customers live a healthier life. I find it difficult to get comfortable, and have been on the search for the ideal pillow for many years. Bedsure's Bio-Zero pillow provides support for side sleepers like myself, with contours that support the neck and head. 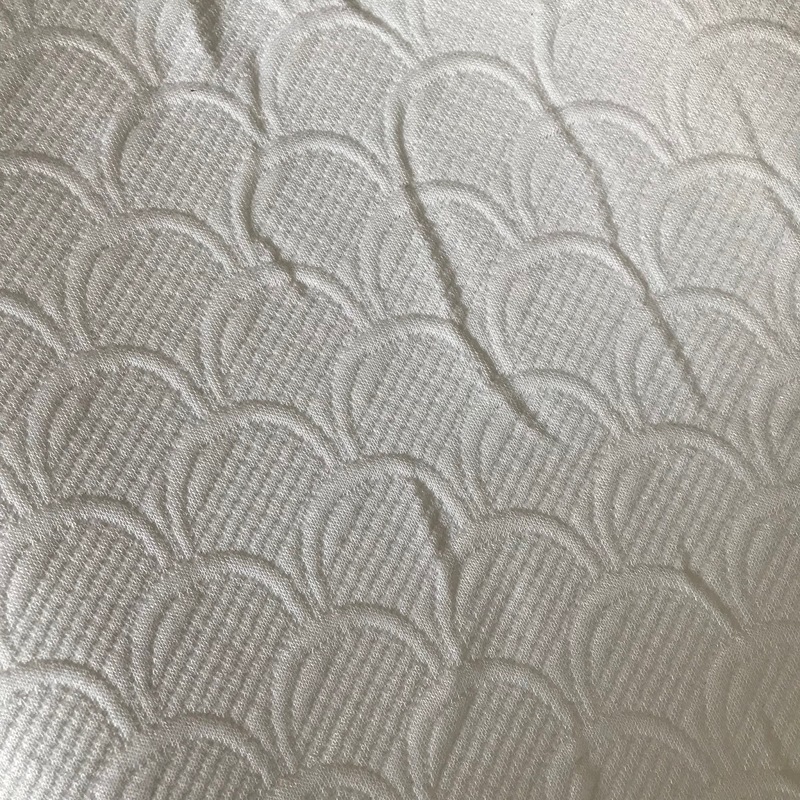 The memory foam is completely breathable, and the cotton construction is machine washable. Topped with a satin pillowcase (for a little touch of luxury,) I had a great night's sleep compared to the usual pillow. I was also interested to try a new blanket. Having heard good things about weighted blankets, (help to make you wake up more rested, echoing the feeling of 'earthing') I was eager to try out Bedsure's version. 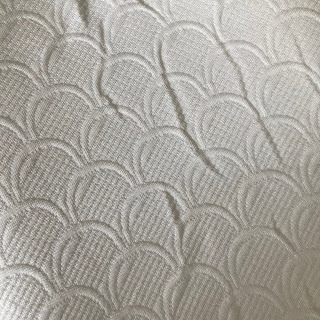 Filled with glass beads and micofiber, the 100% cotton blanket was soft and secure, and it didn't feel like I couldn't escape! I woke up feeling refreshed and ready to take on the day - definitely a feeling I hadn't experienced for quite a while. And the grey version fits perfectly with my neutral bedroom decor too. 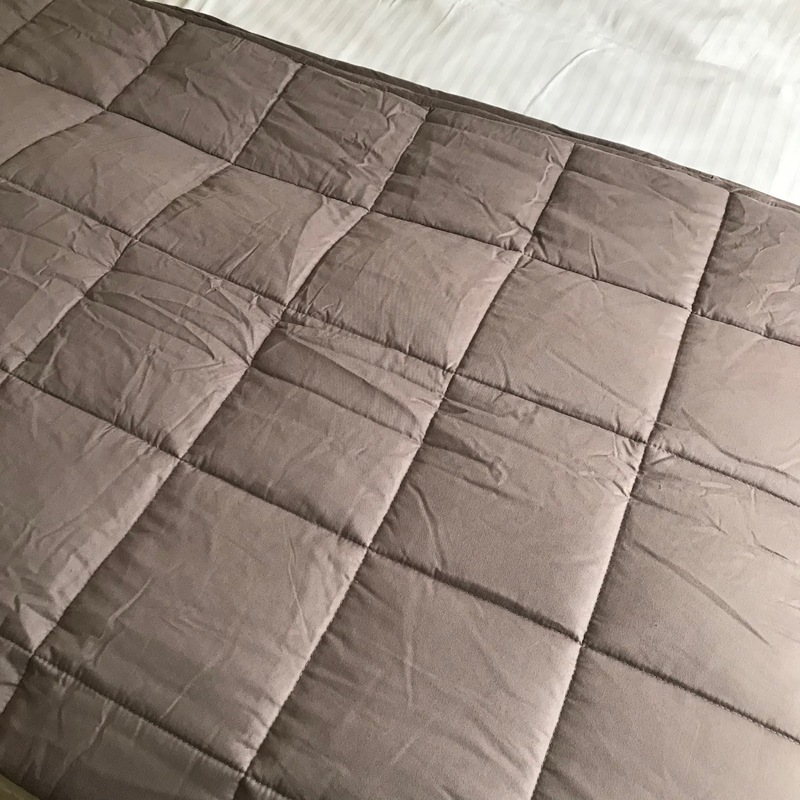 Making the switch to a contour Bio-Zero pillow and the weighted blanket has helped me to get on top of a good night's sleep in a short time span. I've teamed up with Bedsure to help you get restful zzz's too! Score 20% off the Bio-Zero pillow with code BIOZLAUD and 30% off the weighted blanket with code WEITLAUD. Thanks to Bedsure for the two products to review. Parliament has been in recess this week, and the PM had a much deserved Easter break in North Wales. Not too many pictures, but some lucky walkers bumped into May on Snowdonia. May and her husband also marshalled the Maidenhead 10 and took in a bit of canvassing too! The PM is wearing two Herno jackets in the last photo - and some leopard print sneakers. It's been a packed week for the Prime Minister. Here's a recap. 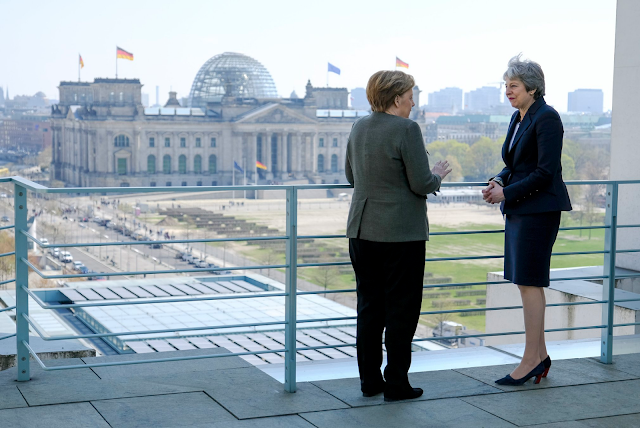 On Tuesday, the PM was in Berlin to meet with Chancellor Merkel. May wore her navy blue Escada skirt suit, teaming it with the navy Curve heels from Russell & Bromley, a navy coat and a patterned scarf. May also travelled to Paris to meet with President Macron. On Wednesday, May was back in Westminster for Prime Minister's Questions before she travelled to Brussels for the European Council meeting. 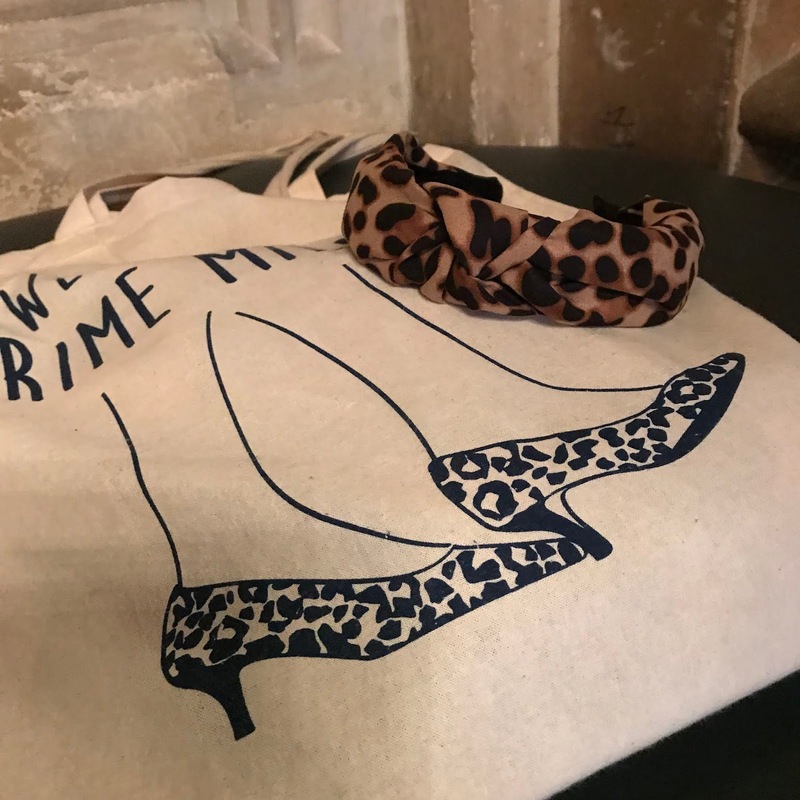 The sassy blue Daniel Blake Orchid suit was the PM's outfit of choice, and May teamed it with the equally sassy leopard kitten heels from Charlotte Olympia. On Thursday, May returned to London and updated Parliament on the Brexit negotiations. She once again turned to Daniel Blake, selecting the chic black tail coat and the Divine black flats with a glittery buckle. 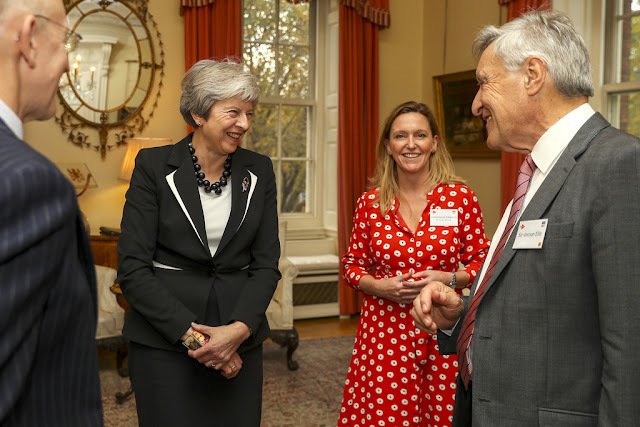 And on Friday, May was in her Maidenhead constituency for the local Association dinner. From the House to the constituency, here's a recap of Theresa May's week. 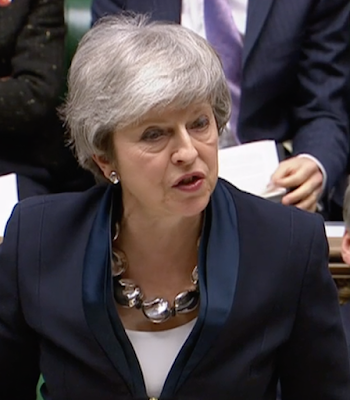 On Monday, the PM was in the Chamber for further Brexit votes. 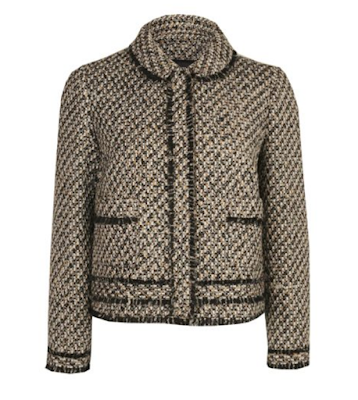 May wore her tweed Paule Ka jacket, teaming it with a skirt and a new Mirta Bijoux Ballsmania necklace. May also held a summit on knife crime at Number 10. 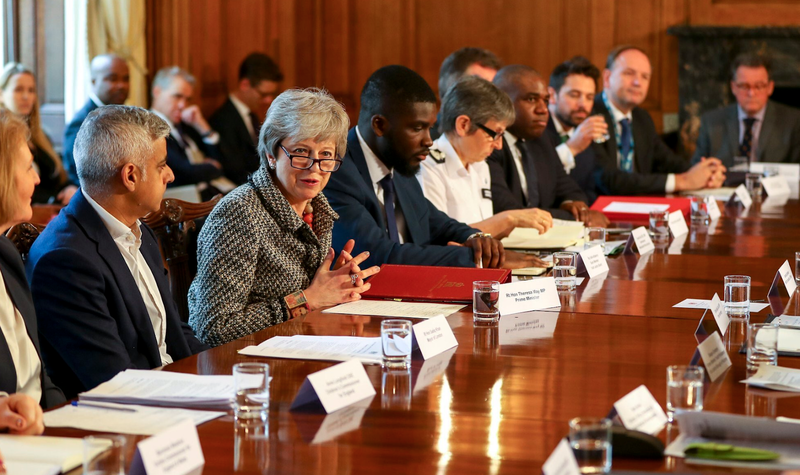 On Tuesday, the PM held seven hours of Cabinet meetings, and ended the day with a televised statement on developments. May wore here black Amanda Wakeley trouser suit, teaming it with the silver chain Amanda Wakeley necklace and the Frame leopard flats from Russell & Bromley. 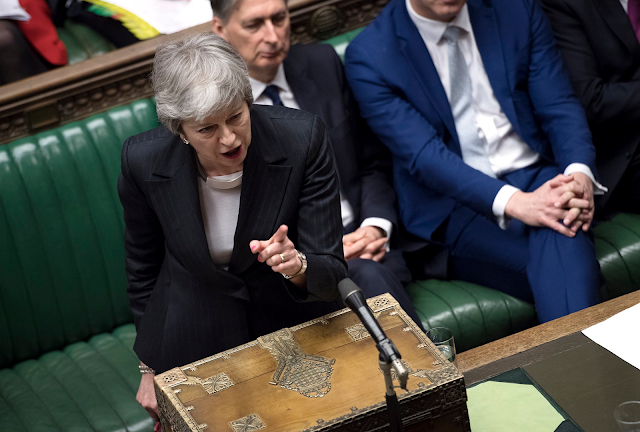 And on Wednesday, May took part in Prime Minister's Questions- returning to an old favourite - the navy Amanda Wakeley skirt suit, the navy Curve heels from Russell & Bromley and a gold bead necklace. 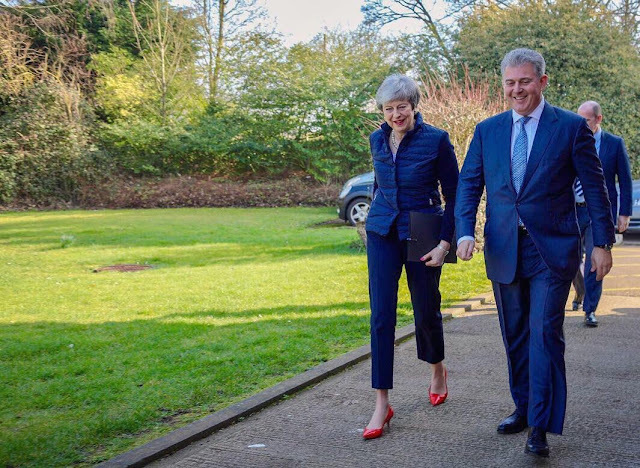 Fluidity, Theresa May's favourite fashion boutique has a mid season sale on - and now's your chance to score some of the PM's recent purchases at a discounted price! This week saw more votes on Brexit- and a week in Parliament for Theresa May. Here's a recap. On Monday, the PM updated the House on the EU Council meeting. May wore her pale blue blazer with a navy skirt and the Humbug kitten heels from Russell & Bromley. She also wore a new Balls necklace from Mirta Bijoux- this time in a metallic blue. And on Wednesday, May was in the House for Prime Minister's Questions. She wore her navy Escada skirt suit, accessorising with a garnet coloured necklace and the red suede kitten heels from LK Bennett. 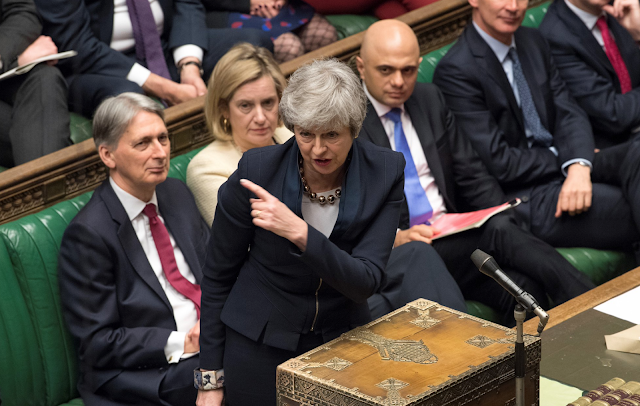 Friday saw Meaningful Vote 2.5 - and May was in the Chamber to close the debate. She wore a red jersey dressing and a camel MaxMara blazer - and the red patent LK Bennett kitten heels. Have you spotted the coloured resin necklace at the dispatch box? Or perhaps at a press conference? Well, Theresa May's newest necklace is by Jackie Brazil. A resin jewellery fashion brand hand made in Brazil, their jewellery is considered wearable art, with each item completely unique. The resin material can be recycled, making this a truly eco-friendly accessory. The designs are fresh and contemporary, incorporating the colour and happiness of Brazil's lifestyle and attitude, with a focus on the colours, shapes and unique design. 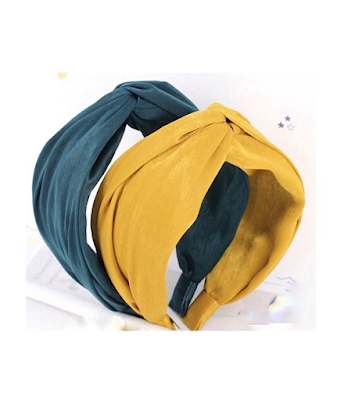 The brand have wholesaled their jewellery in the UK for over 15 years and their items can be found in places like Sahara London, Dulwich Picture Gallery, the Ashmolean Museum, WOW Hythe and Bijouled Harrogate. 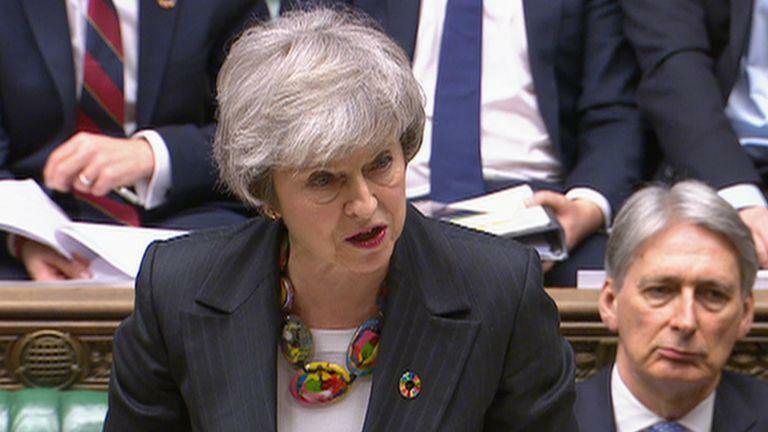 As for the Prime Minister, she has worn the Riverstone Kandinsky mix necklace on a few occasions since the beginning of the year- adding a bit of optimistic colour to incredibly tense proceedings! 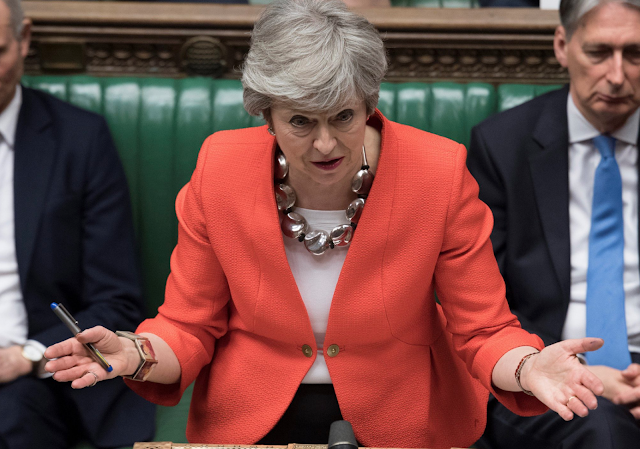 May has worn the necklace at a press conference with Japanese Prime Minister Shinzo Abe, for Prime Minister's Questions and to the Commonwealth Day service at Westminster Abbey. As the brand itself says, "[the necklace] matched her style perfectly, creating the right visual impact, sending a message of self-confidence and independence to a global audience." We couldn't agree more. 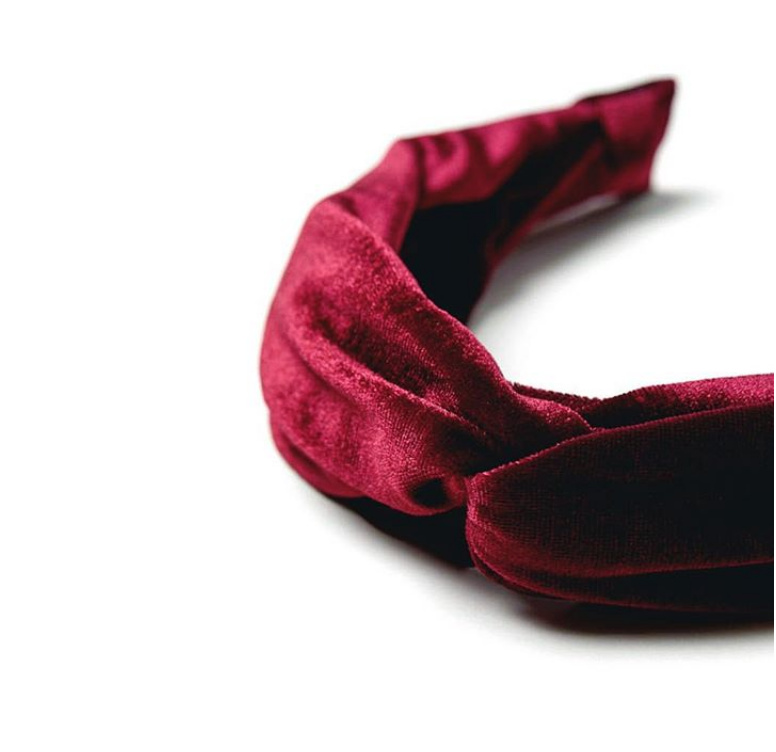 And Jackie Brazil is giving one lucky reader the chance to own the Kadinsky necklace! To enter follow us on Instagram/ Jackie Brazil and tag two people in the comments. 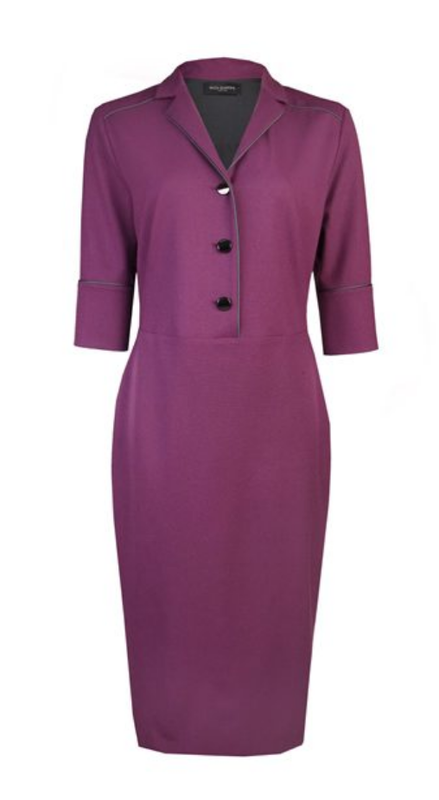 Jackie Brazil is currently working on a range of new, eye-catching designs for summer 2019- and here's a sneak peek! Hands up if you were a Sabrina the Teenage Witch fan in the Noughties? I loved the show, and would rush home from school every day to catch the latest episode or a re-run. I had the books and the magazine and make-up collection. Big fan! So I was similarly excited to see the remake launch on Netflix late last year, and how it would put a new spin on a childhood favourite. Predictably darker and spookier than the original, many of the key themes are visible. The bonds of friends and family, the battle of good vs. evil and staying true to oneself. 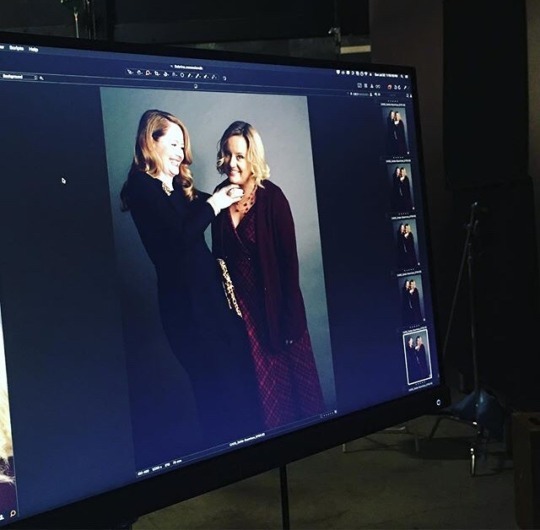 Whilst the storylines are pretty gripping, so is the awesome fashion sported by the cast. 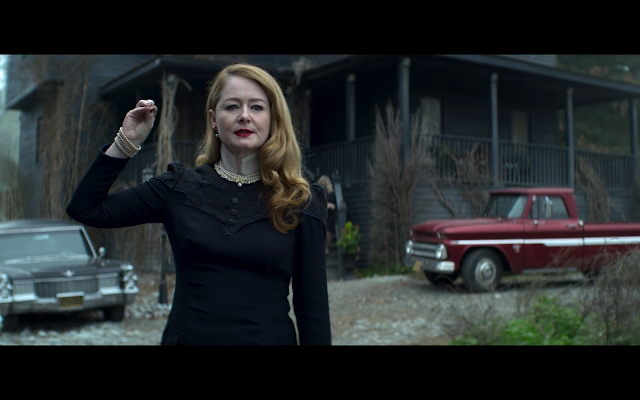 Aunt Zelda (brilliantly portrayed by Miranda Otto) is the sassiest dresser, and wins hands-down in the style stakes. She has a serious 1940s old Hollywood vibe going on, and we see Zelda wear lots of black, navy and other dark hues in rich fabrics such as velvet, lace, fur and silk. Glamour knows no bounds, and Zelda accessories with chunky rings, statement necklaces and pearl earrings. 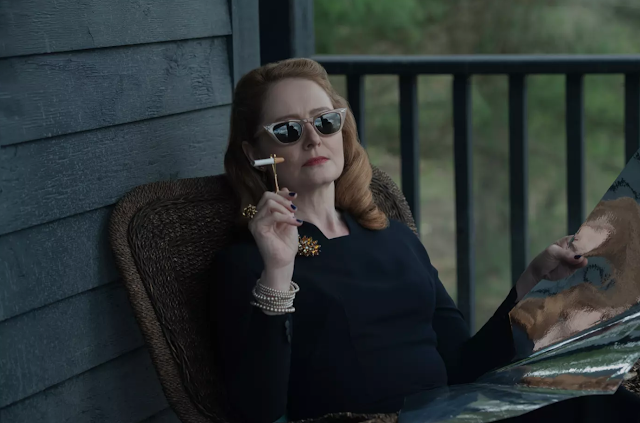 She also has a snazzy cigarette holder and some seriously chic winged sunglasses. And turning to make-up, Otto wears items from Charlotte Tilbury for her role as Zelda. Her signature matte pink lipstick is the Secret Salma shade, and make-up artist Candice Stafford-Bridge using the Love Liberty shade for more darker situations. The iconic hair? All thanks to tried and tested hot rollers. Whilst we can't all aspire to be as devilishly glamorous as Zelda in real life, you can get a smattering of her style with these witchy picks. This week was again dominated by Brexit. Here's a recap of the Prime Minister's week. On Monday, the PM returned to Number 10 after a weekend in her Maidenhead constituency. 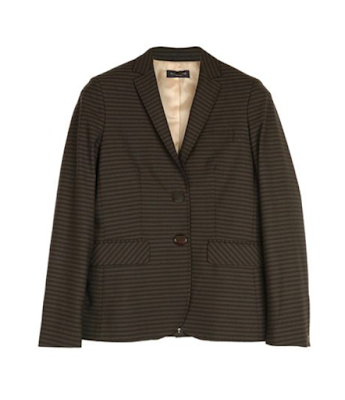 Snapped arriving, May wore a brown tailored jacket with trousers and the Charlize loafers from Russell & Bromley. 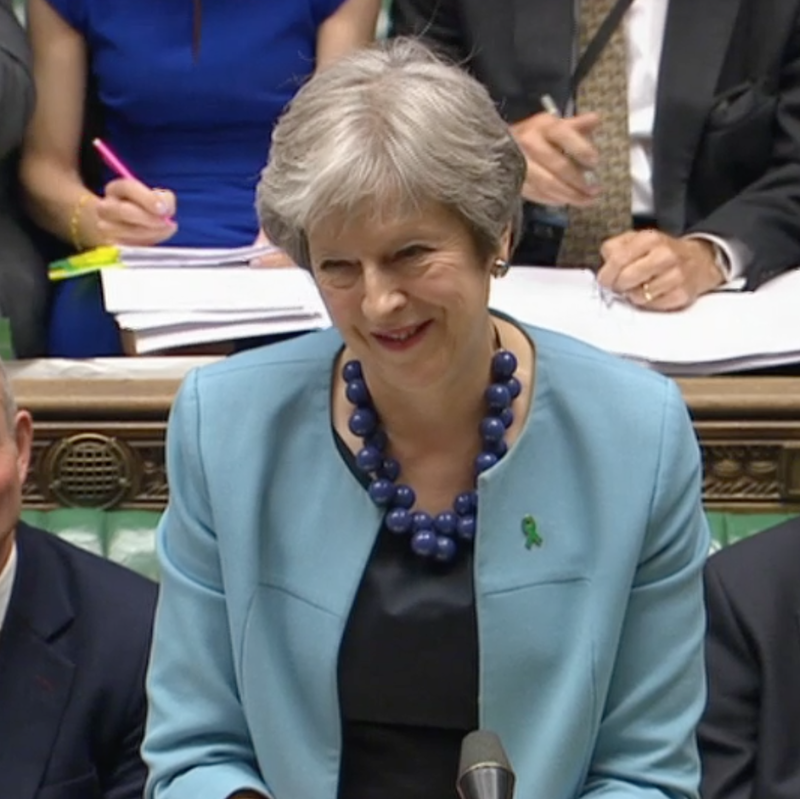 On Wednesday, May was in Parliament for Prime Minister's Questions. May wore her grey Daniel Blake trouser suit, teaming it with the black and red Curve pumps from Russell & Bromley. And on Thursday, the PM was in Brussels for the EU Council meeting. It was another Blake outfit- this time the navy fleck Military jacket and a pair of navy trousers. May wore her navy Twiggy kitten heels from Russell & Bromley and accessorised with the Amanda Wakeley chain necklace and bracelet. 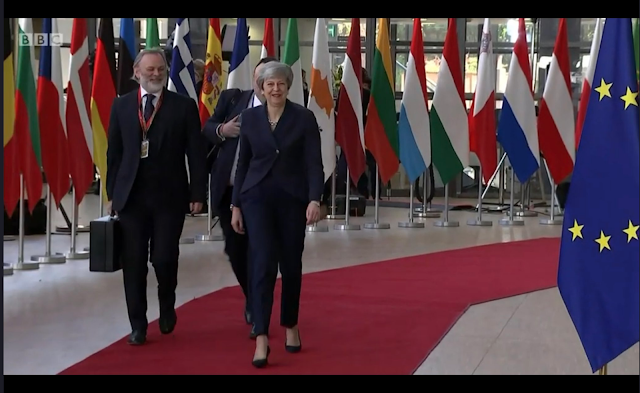 Friday may was in Brussels for further meetings- she wore her purple Escada dress and the elusive pair of black and leopard ankle boots that we are still trying to identify! From celebrating the Commonwealth to Brexit votes, here's a recap of Theresa May's week. On Monday the PM was in Westminster Abbey to mark Commonwealth Day. 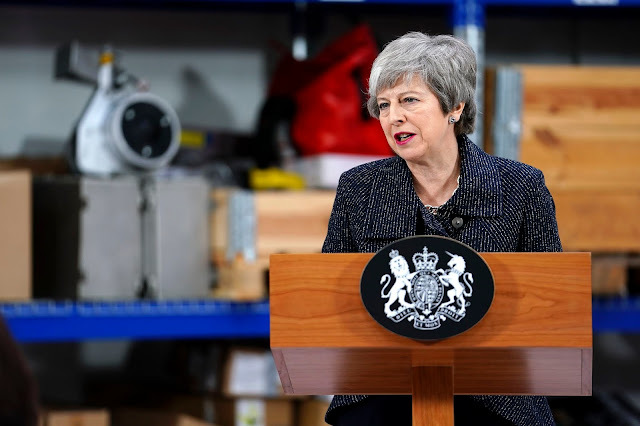 May wore her new blue Daniel Blake coat, pairing it with a navy skirt and white top; She accessorised with a stylish navy hat with feather detailing from Liz Felix Millinery and the navy Twiggy heels from Russell & Bromley. 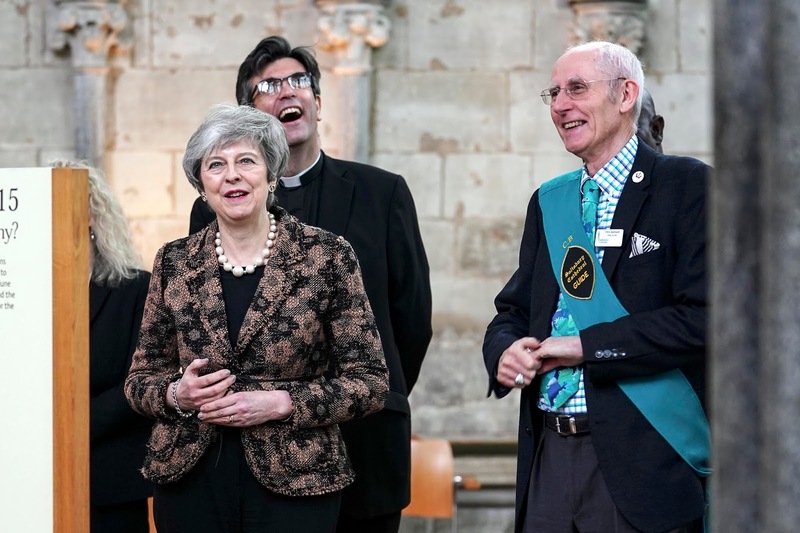 Following the service, May headed to Strasbourg where she changed into a black Daniel Blake custom jacket for a late night press conference. On Tuesday the House began the first day of further Brexit votes. May, nursing a poorly throat, added some colour to proceedings with her orange Daniel Blake Nehru jacket. She wore black trousers and the super comfy (and super cute) red Audrey kitten heels from LK Bennett. And on Wednesday, May took part in Prime Minister's Questions before further Brexit voting. She wore her navy Escada skirt suit, teaming it with the navy Curve heels from Russell & Bromley and accessorising with an oversized green jewelled necklace. 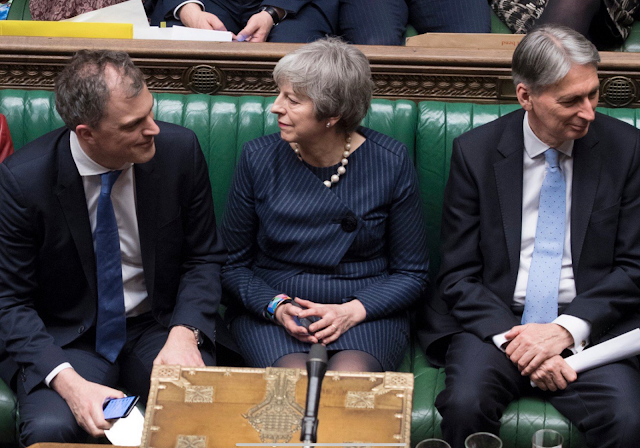 Thursday saw the final day of Brexit votes and May wore her grey check Daniel Blake dress with the black Curve heels. A classic look. From visiting Salisbury to marking International Women's Day, here's a recap of Theresa May's week. 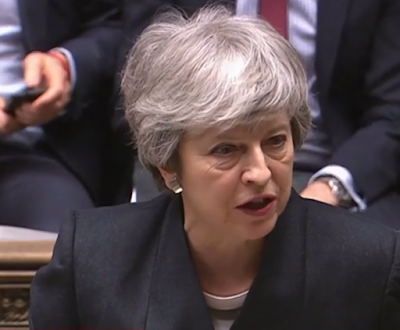 On Monday, the PM was in Salisbury to mark a year since the Russian attack. 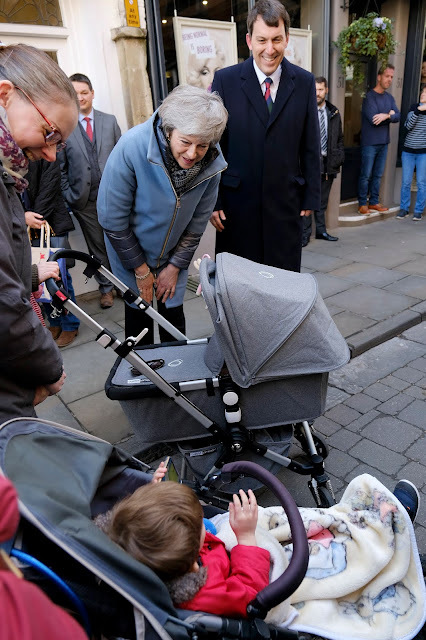 Meeting local businesses and residents, May wore her brown tweed floral Paule Ka jacket with trousers, pairing it with the Clean Cut leopard loafers from Russell & Bromley and her baby blue Herno coat. On Tuesday, May was at Buckingham Palace to mark 50 years since the Investiture of the Prince of Wales. The PM wore her purple Origami skirt suit by Daniel Blake, picking the iconic leopard Kitty heels from Charlotte Olympia and the silver Balls necklace and bracelet from Mirta Bijoux for some serious accessorising. 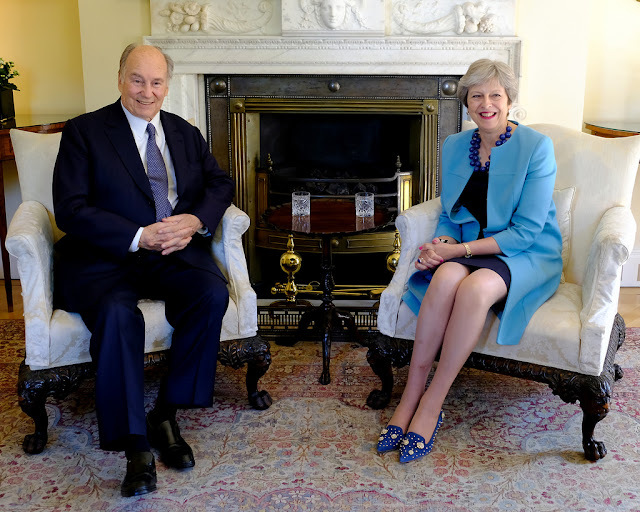 Later in the day, May welcomed the President of Cyprus to Number 10. 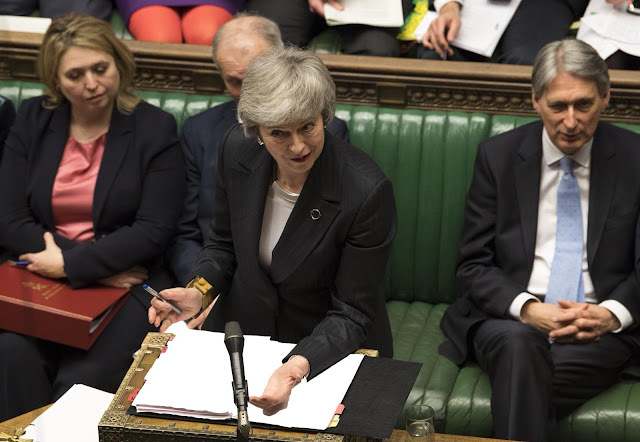 And on Wednesday, May took part in Prime Minister's Questions- this time wearing her grey pinstripe trouser suit from Daniel Blake. She wore the Curve black heels from Russell & Bromley for an empowering look. 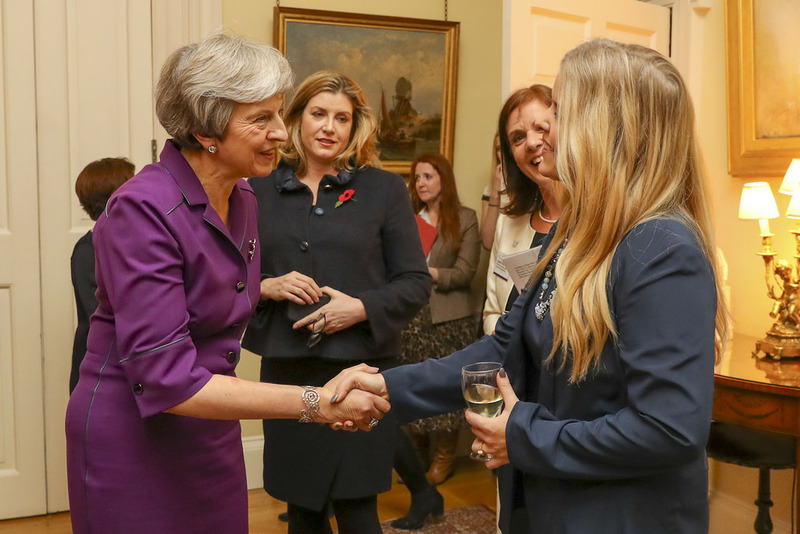 On Thursday, the PM hosted an International Women's Day event at Number 10. 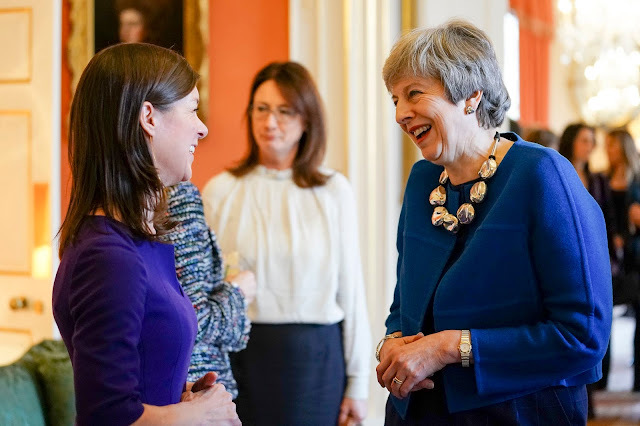 May wore her blue check Daniel Blake dress, teaming it with a blue cropped jacket from DvF and a seriously stylish oversized silver necklace. 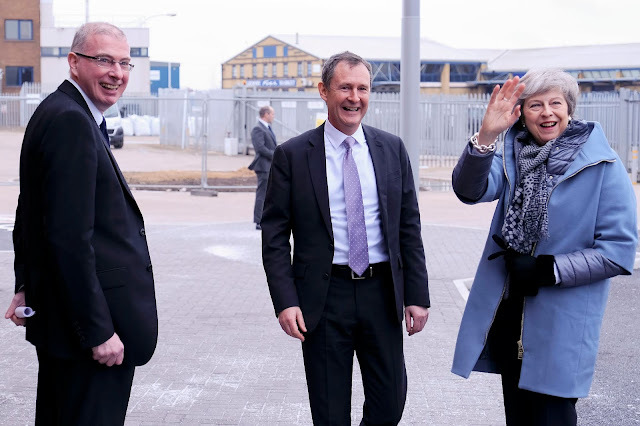 And on Friday, the PM was in Grimsby delivering a speech about Brexit. 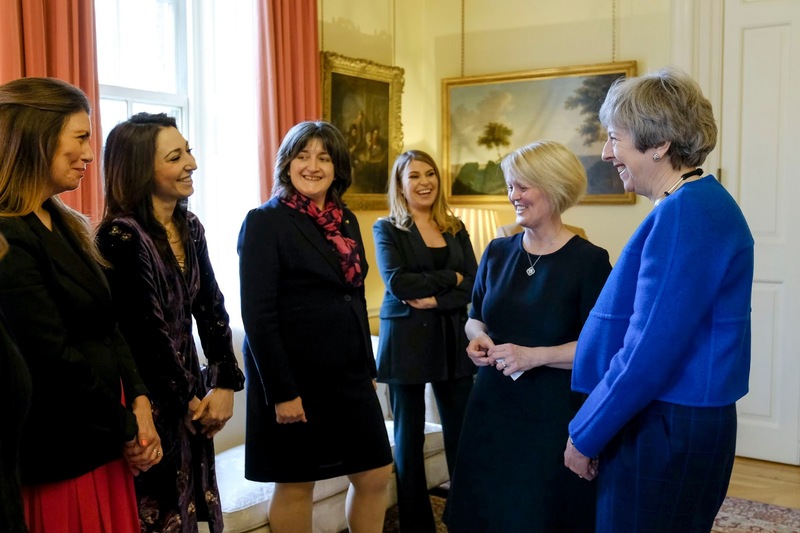 May turned to another Daniel Blake jacket for the event, teaming it with black trousers and the leopard Delicious flats from Russell & Bromley. From two days in Egypt to a busy week in Westminster, here's a recap of Theresa May's week. On Monday, the PM was in Sharm el-Sheikh for the EU Arab Summit. May arrived the day before wearing a new, blue and silver patterned coat, teaming it with black trousers and the leopard Delicious flats from Russell & Bromley. And on Day 2, she wore the pink coat from Harris Wharf, pairing it with the Charlize black and silver toed loafers from Russell & Bromley. 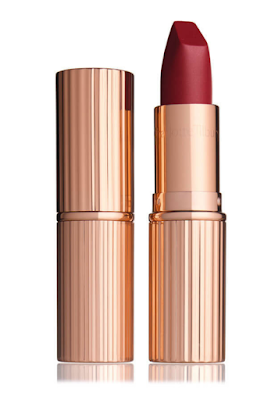 A definite winner! 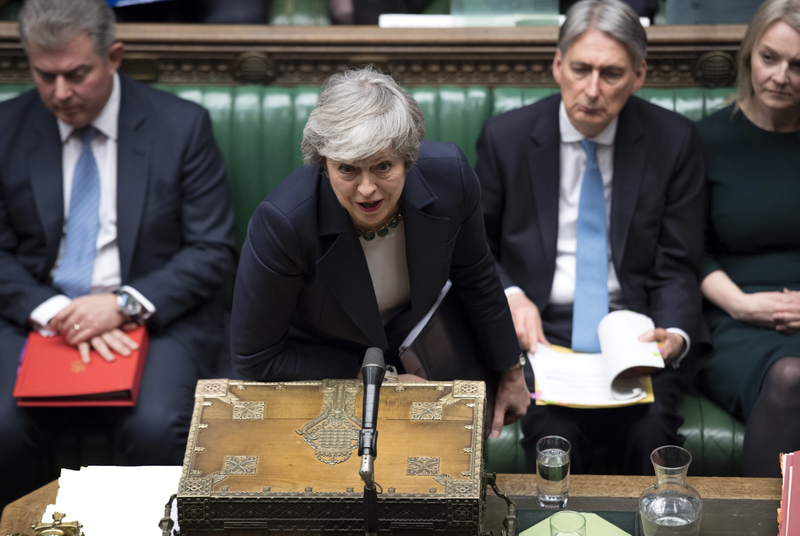 Tuesday saw May in the House of Commons to deliver an update on Brexit negotiations. The PM wore her stylish navy suit with silk collar- which we now know is by Amanda Wakeley! She made it a red, white and blue theme, choosing the red suede LK Bennett kitten heels and debuting a snazzy new silver necklace. And on Wednesday, the PM was back at the dispatch box for Prime Minister's Questions. 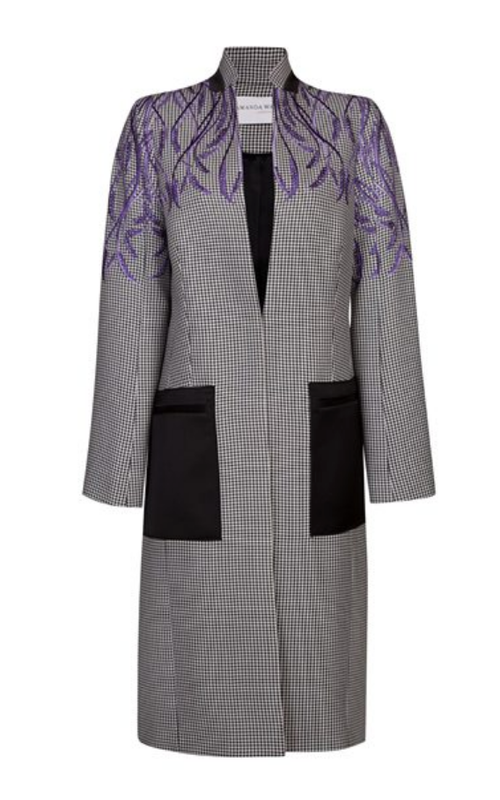 The striking satsuma Nehru jacket by Daniel Blake made a welcome reappearance- and May paired it with a black skirt and the Curve heels from Russell & Bromley. On Thursday, May welcomed King Abdullah II of Jordan to Number 10 ahead of a Britain/Jordan conference. The PM wore a black dress and her black and white colourblock blazer from Escada. 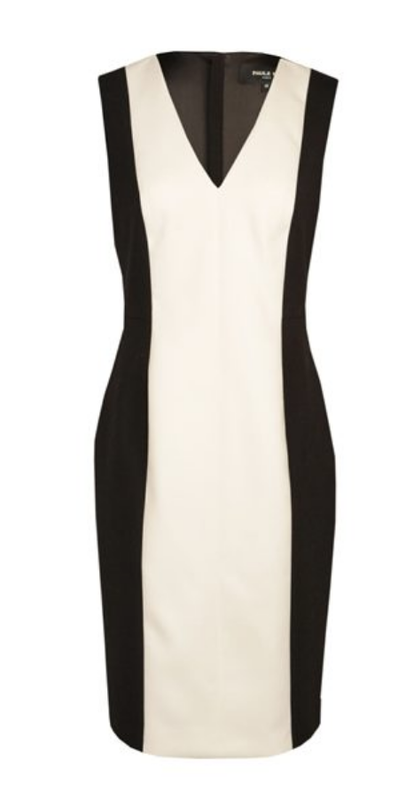 She continued the monochrome theme with the fierce zebra Starlet heels from Russell & Bromley. 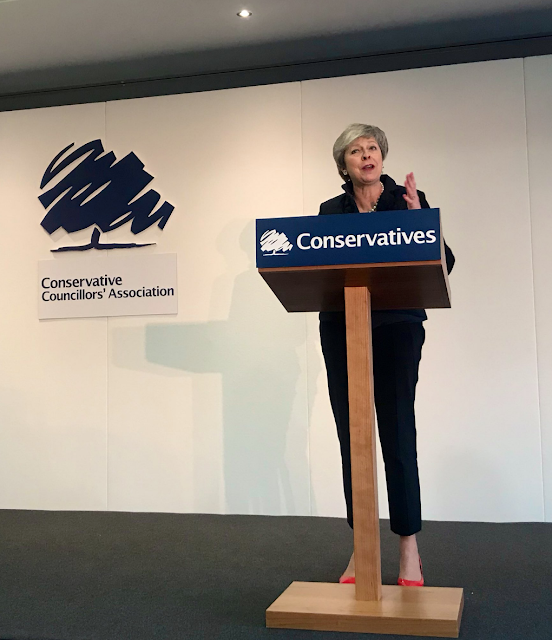 The PM was at the Conservative Councillors' Association conference today. We love this primary colours based outfit- with a new navy jacket teamed with a pair of patent red kitten heels from LK Bennett! 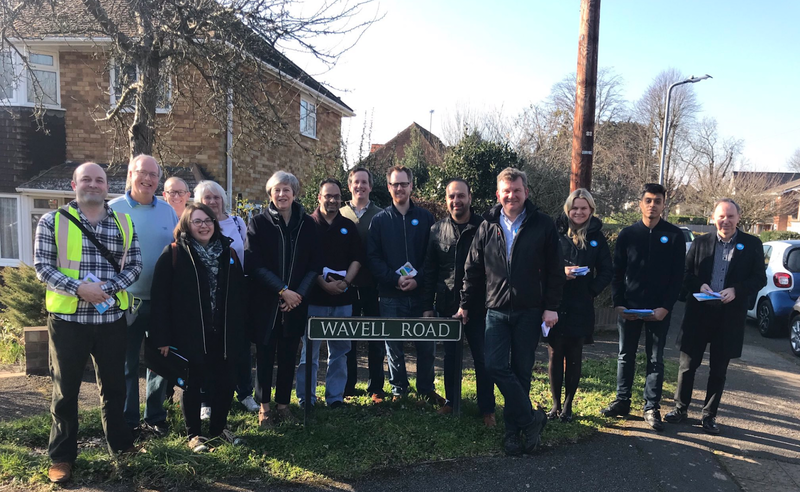 After the conference, May hot-footed it back to her Maidenhead constituency for a spot of afternoon canvassing.